I’ve written here before now (though it’s hard to believe it was three-and-a-half years ago) about the appeal of capturing film title frames grabs as a cataloguing record. The last time was on the occasion of discovering Steven Hill’s Movie Title Screens Page, an heroic enterprise documentating and displaying screen grabs of every film title frame that he can, mostly from VHS and DVD copies, giving title, year, director, image source, aspect ratio and Amazon link. To date he has 7,614 films so recorded, a number of them silents, and he’s still going. Now I’ve found another site doing the same. The Movie Title Stills Collection does much the same, but is rather more stylishly designed, if not quite as encyclopaedic as Hill’s site – yet. The MTSC is he work of web designer Christian Annyas, and documents movie titles from 1902 to 2011. There’s not as much information at Hill provides – simply image, title, director, year and link to Amazon – but it’s a lot easier to find the silents, with the site being divided up into decades, including 1900-1919 and 1920-1929. There are some curated sections, on such themes as the typography of Jean-Luc Godard (which looks fabulous) and Saul Bass’s title sequences (ditto). 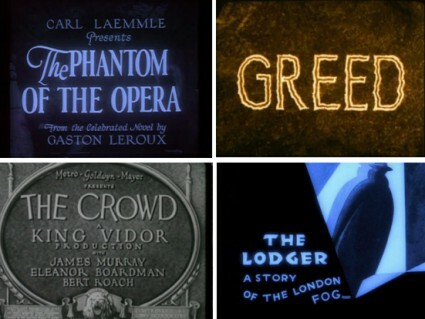 It has to be said that we have got better at film titles as the decades have gone on, so the silent era examples tend towards the functional (with one or two eye-catching exceptions, such as Greed and The Lodger). But the site makes for compulsive browsing, a great way of surveying film history and seeing how the medium has commanded our attention down the years.